The ability to merge data to online merchant's product data feeds is one that can deliver great value by creating high quality content. In this article we'll take a look at some of the options available to merchants, digital marketers and ppc-managers when it comes to merging data, and how it can increase product data accuracy and integrity, enrich and optimize value to your campaigns. You already know that data is driving marketing efforts globally. The downside here is the information you would like to include in your marketing efforts is rarely readily available. Yet with an effective feed marketing tool you can merge multiple feeds together. These may contain product data from various sources, additional info about certain products, valuable missing data or statistical information such as weather data. Web scraping is a means of getting hold of data for your import feeds which is not currently included, but may be available elsewhere online - e.g. from your own e-commerce store. The image above shows some of the options that Business Intelligence solutions from WakeupData offer. As an example, certain channels and marketplaces require unique GTINs (global trade numbers) for each product. If these aren't currently listed in your product feed you can get hold of the necessary data from your online store or by scraping an online database - and then merge it with your feed. Having up-to-date stock data information for all your sales channels is crucial for the success of an online store. For example, you may be selling on Amazon, Facebook, Google Shopping, Pricerunner and Miinto simultaneously. Every time you sell an item, the stock levels for the listings on all those channels need to be updated - selling items which you no longer have in stock can get reprisals from your sales channel. The solution is to merge your stock level data with your export feeds multiple times in a day. This means you can stop pushing products which are nearing the end of stock - saving your Cost Per Click and avoiding having frustrated customers. Tools like Clerk.io let ecommerce merchants extract valuable data from their online sales. Recommendations data based on your customer's journeys can be merged to your product feed from within the WakeupData interface - so you can prioritize the important products on sales channels, just as you might already do on your website. What's more, you can add further value to your feeds by merging key information like the weather data for the next 10 days. This means that you can assign certain 'weather relevant' products to be pushed when certain weather occurs using custom labels. For example, sunglasses could be pushed in advance to regions experiencing hot weather, whilst rainjackets can be simulateneously pushed to other regions with poor weather. You can carry out the whole process of merging the weather or recommendations data to your data feeds from within the platform, with our team on hand to guide you every step of the way. It's probably becoming clear by now that there are so many options when it comes to enriching and adding value to your product data feeds. 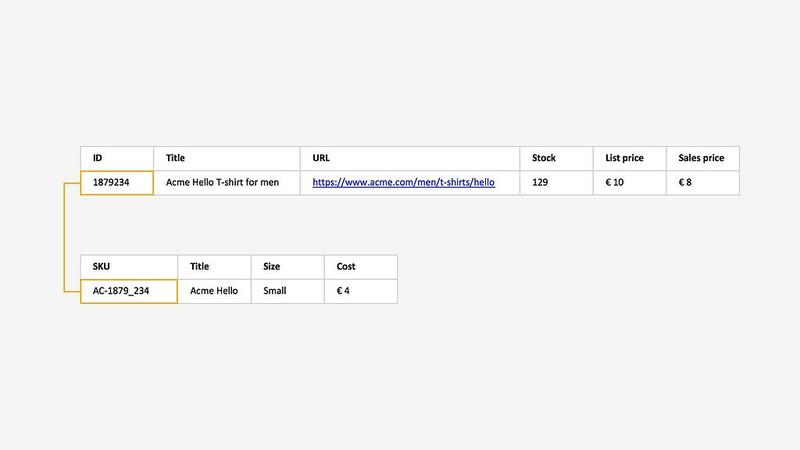 As a simple example, adding custom labels based on specific categories to your Google Shopping feed can then be used in your campaigns to set optimal bids. Festmagasinet, a WakeupData client, was able to do just this by using effective custom labels, adjusting their bidding strategy according to the season and the products within specific custom labels. In a 12-month period saw 20% more clicks and 3% more conversions. Convincing your viewers to commit to that crucial purchase decision is often purely based on having the right price. Therefore, being able to quickly adjust your feed's pricing based on good-quality data is important - particularly when merchants are selling similar products to multiple competitors. That's why our Business Intelligence tools let you regularly crawl competitor sites to get the latest price changes and adjustments. This means you can push products when they are out-of-stock with your competitors, or adjust the pricing on certain items when they have increased with your competitors. You can add multiple files to product data you currently have for better optimized integrations. WakeupData can merge any kind of information with your already-imported product data in various formats such as CSV, TSV, XML and JSON. Combining data with a previous source can be tricky, therefore we also provide a top-of-the-line matching ability that includes conditional and expression based matching. WakeupData's Data feed management solutions mean that enriching and improving your product data through merging couldn't be easier. Get in touch with us if you have any questions or get your free evaluation below.